When a mid-major underdog starts the season on the road with a against a favored team, one of two things usually happens: The smaller school gets off to a strong start and fights until the very end or the team plays so conservative that they find themselves down by the spread before the end of the first half. The latter was the case for the Ohio Bobcats on Sunday when the team traveled to take on the ninth-ranked Louisville Cardinals at Papa John’s Cardinal Stadium. The moderate, careful approach taken by Ohio head coach Frank Solich was best documented by the ‘Cats’ first two drives, which the Cardinals embarrassed Solich and company in every facet of the game. The Green and White ran a total of six plays – four of which were Beau Blankenship rushes up the gut – and netted six yards and no points. The overall result was an excruciating 49-7 loss. The Bobcats knew going into the game that with a Heisman hopeful in quarterback Teddy Bridgewater lining up under center, there would be minimal time to shake off any pre-season rust. The Cardinals, who were coming off of a sugar high after a bowl victory over Florida last season, and Bridgewater exposed the jittery Ohio defense with speed and a relentless attack from offensive line early and often. Bridgewater began the game with eight straight completions, finding each target more open than the last. The Cardinal quarterback stayed calm in the pocket with pro-type mechanics and turned miscues by the Ohio secondary and inexperience on the defensive line into three touchdown drives to start the game. Louisville’s gunslinger finished the game 23-of-28 for 355 yards and five touchdowns – four of which occurred in the first half – in tearing apart the rotating cast of Ohio defensive members. Besides from a Xavier Hughes interception that immediately followed an errant turnover by Derrius Vick, the Cards were near perfect in almost every phase of the game. “We understand that we played a really good team, and they’re capable of being a top-5 team,” Ohio quarterback Tyler Tettleton said. Vick came into the game for Ohio’s third drive to aid Tettleton, but did not see another snap until the final quarter. Tettleton was finally offered the chance by the swarming Cardinal defense to open the offense up outside of the middle of the field during the team’s fourth drive, but by that time it was too late for him to attempt a comeback. To add insult to injury, Ohio kicker Matt Green missed a 32-yard field goal wide left to end one of Ohio’s sparse trips to the red zone Sunday in Louisville. The Cardinals capitalized on the mistake by driving 80 yards down the field, scoring on an uncontested 40-yard reception from Bridgewater to Kai De La Cruz. With the ‘Cats staring down a 28-0 deficit heading into the locker room at halftime with no momentum and not a trace of determination, the Green and White were in for an excruciating next 30 minutes. Ohio got on the board with a Ryan Boykin 10-yard touchdown run in the third quarter, but not before Louisville added three more touchdowns. Even with Bridgewater resting on the bench and causing no more harm to the defeated Bobcat defense, Louisville still managed to extend their lead to 42 thanks to another De La Cruz second-half score. Ohio’s new-look offensive line seemed overwhelmed by the Louisville front seven from the onset. Constant defensive pressure caused Tettleton to finish the day 11-of-23 for 140 yards, while Blankenship managed a measly 23 yards on 12 carries. As Solich stated last week during practice, the Bobcats are not a team that gets too high off a win or too down after a loss. With this being one of the most excruciating losses for Ohio in recent memory, it will be interesting to see how the team responds on the field against North Texas next Saturday. Kickoff for the home opener at Peden Stadium is set for 7 p.m. 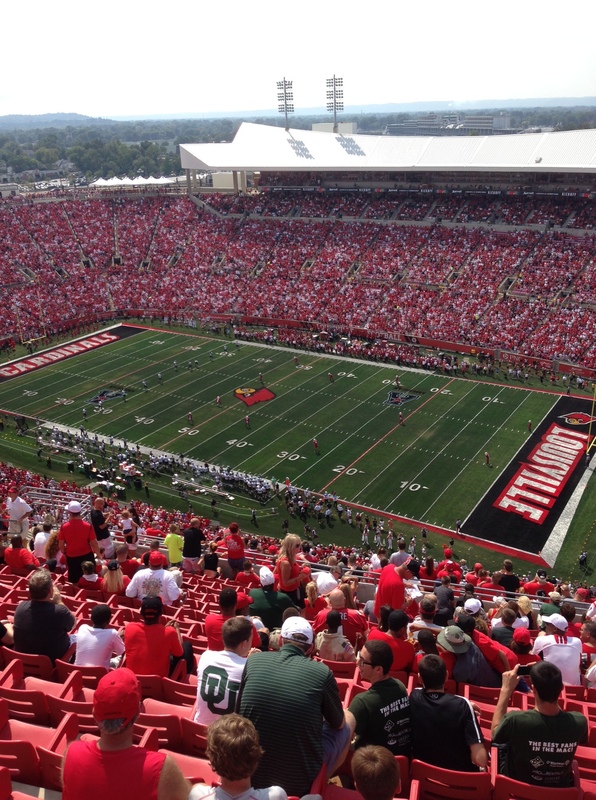 There were 55,332 in attendance on Sunday at Papa John’s Cardinal Stadium, the second largest crowd in stadium history. Offensive linemen Jon Lechner (shoulder) and Sam Johnson (knee) both went down and “should be out for a long time.” Linebacker Keith Moore also went down in the first quarter with an ankle injury and did not return. The 42-point loss was the Bobcats’ worst since their September 17 meeting with Virginia Tech in 2005 season – a 45-0 loss. Tyler Tettleton pointed out that although today’s loss was excruciating, it does not derail their goal of winning their conference. Travis Carrie said that the main thing that affected him Sunday were his cleats. Carrie did trip on his feet a couple times on the field, but he changed his cleats in the second half. Louisville wide receivers Damian Copeland and Kai De La Cruz accounted for four of Teddy Bridgewater’s five touchdown passes. Copeland caught six passes for 98 yards and two touchdowns, while De La Cruz hauled in four catches for 116 yards and two touchdowns.